Identity is a multipurpose, modern and well crafted one page portfolio for creative professionals. Anyone can showcase their personal resume, work history, education, projects and other personal information beautifully using Identity. This is built with modern technologies like HTML5, CSS3, jQuery, Bootstrap 3. It is fully responsive with clean modern design. 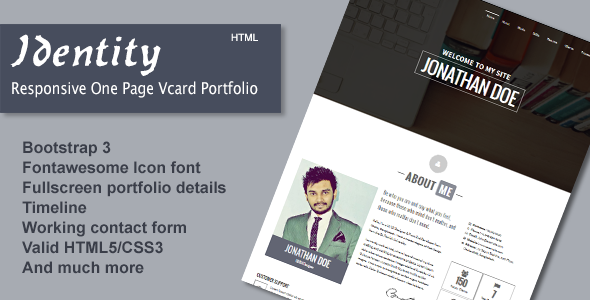 Item Reviewed: Identity - Responsive One Page Vcard Portfolio 9 out of 10 based on 10 ratings. 9 user reviews.